There are many reasons you might want to filter your drinking water. Likewise, there are many companies looking to sell you a water filter! But how do you tell which ones really work, and which are all marketing nonsense? One way is to pick a NSF Certified water filter, which has been independently tested and approved by NSF International. In this guide, we’ll help you find the best NSF Certified water filter for your needs & budget. 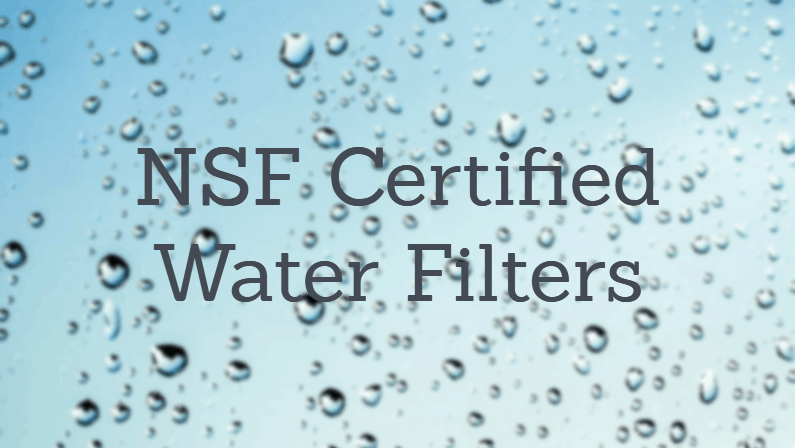 Many of the most-reputable water filter manufacturers will get their products NSF Certified. So, if you’re lost in a sea of too many filter options, looking for an NSF certification is a great place to start. What are the different NSF Standards? These selections were made based on a combination of our own testing and research, NSF Certifications, manufacturer specs and third party NSF water filter reviews. The Aquasana OptimH2O system is a reverse-osmosis filter setup that installs under your kitchen sink. We chose it as the best NSF Certified water filter in 2019 because it’s earned several NSF certifications – meeting standards 42, 53, 58, 401 and P473. Most filters are only certified for standard 42 and/or 53, but this unit goes further to effectively filter out a huge variety of potential contaminants. For complete peace of mind, it’s tough to beat this system. It’s designed to filter out more than 5x the number of contaminants that most reverse osmosis systems cover. Not only is it designed to be a versatile filtration system – it’s actually third-party certified to be just that! This unit is more pricey than the others on this list, but it’s also more effective. It comes with everything you need, including a holding tank, reverse osmosis filter setup, and even a stylish faucet! It even has a remineralizer; a type of filter that adds healthy minerals back into the filtered water. That’s why the overwhelming majority of Aquasana water filter reviews from customers are very positive. Overall, this is the best NSF Certified water filter. Click here to buy from Aquasana, or Click here to buy from Amazon. 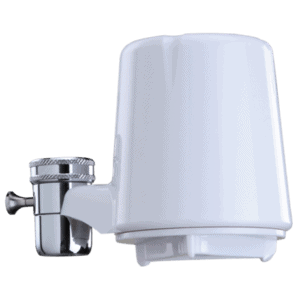 The Culligan FM-15A is a budget-friendly NSF water filter that attaches directly to your faucet. It features an easy on/off switch that allows for easy access to higher-flow, non-filtered water. It’s certified by NSF to meet standards 53 and 42, and it’s effective in removing a wide range of contaminants. It’s well built, with a durable metal and plastic construction. The affordable replacement filters on the FM-15A are designed to last for 200 gallons of filtered water. So, both the upfront cost and the ongoing costs are quite affordable for this unit. It’s made by a trusted brand, and earns solid reviews from customers. If you’re looking to stick to a budget, or you just aren’t sure if you need a pricey filter, this is a great option. Learn more here. 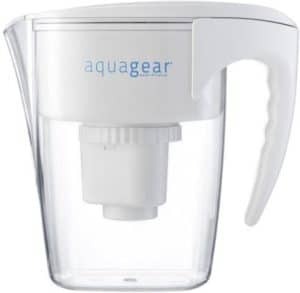 The AquaGear Water Filter Pitcher is the best NSF certified water filter, if you prefer the simplicity of a water pitcher style. This style of filter requires no installation or prior experience to use – you simply fill it with tap water, keep it in your fridge, and enjoy clean, filtered drinking water all day long! The AquaGear is NSF 53 certified AND NSF 42 certified, meaning that it meets two of the most important standards that NSF regulates. It’s tested for the effective removal of chlorine, chloramines, lead, fluoride, chromium 6, mercury and more. It uses an advanced 5-stage filter that’s effective in removing or reducing a huge range of contaminants. This is also probably the most affordable NSF 53 water filter out there – although keep in mind the cost of replacement filters. Bottom line, this is a great product and one of the best NSF water filters out there. Click here to learn more about the AquaGear. NSF International is a public health and safety organization that works to improve global human health. They do this primarily by testing and certifying various products. They are heavily involved in food safety testing, water filtration technology certification, and consumer product regulation. In the context of water filters, NSF Certified means that the product has met or exceeded the NSF Standards for Water Treatment Systems. These are formal guidelines laid out by the NSF. Manufacturers of water filtration systems will send their products to NSF for testing in order to try and earn the NSF Certified seal. So, in short, NSF Certified means that an independent, third-party organization has thoroughly tested the product and found it to meet certain guidelines. It’s a stamp of approval, and gives you some peace of mind knowing that the product has actually been evaluated by a reputable third party. This helps set some of these products apart from the competition. 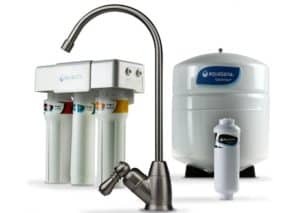 All water filter manufacturers say that their products will remove X, Y and Z, but few of those claims have actually been verified by a reputable third party. When you get a water filter certified by NSF, you’ll know that industry experts that aren’t affiliated with the manufacturer have actually tested the product and confirmed its effectiveness. NSF/ANSI 42 – Filters meeting NSF 42 are certified to reduce aesthetic impurities, such as chlorine and unpleasant tastes/odors. NSF/ANSI 53 – Filters meeting NSF 53 are certified to reduce one or more contaminants with a known health effect, according to the U.S. EPA. Examples include lead, giardia, VOCs, etc. NSF/ANSI 44 – Products meeting NSF 44 are certified to help soften water by reducing deposits of magnesium and calcium. NSF/ANSI 55 – Products meeting NSF 55 are certified to help inactivate viruses, bacteria and cysts through the use of ultraviolet light. This certification has two classes: class A can help kill bacteria and viruses, while class A can reduce non-disease causing bacteria. NSF/ANSI 58 – Products meeting NSF 58 are certified to help reduce contaminants that are regulated by the EPA and Health Canada. Examples include lead. NSF 58 filters are usually reverse osmosis setups. NSF/ANSI 401 – Products meeting NSF 401 are certified to help reduce one or more emerging contaminants, which refer to pharmaceuticals or chemicals that are potentially harmful, but are not yet regulated by the FDA or Health Canada. There are many more NSF standards (full list here), but these are the most common and relevant for home water systems. NSF and other product testing/certification organizations such as WQA and others, are all essentially very similar. These are organizations that conduct testing on products from various industries. All these organizations follow certain government regulations and standards, and are accredited by approved organizations. The two largest ones are American National Standards Institute (ANSI) and the Standards Council of Canada (SCC). So, when comparing WQA vs NSF, there’s really not much of a difference. Both follow public-domain NSF/ANSI standards when conducting their tests. Taste – Generally speaking, filtered water simply tastes better than unfiltered tap water! Many contaminants can cause an off-putting taste, but some of the most common offenders are chlorine and iron. By using a filter, you can enjoy cleaner, fresher water – which may also inspire you to drink more and stay more hydrated! Safety – There are some safety concerns associated with drinking unfiltered tap water. For instance, chlorine has been linked to an increased risk of cancer, while fluoride has even been linked to brain damage. Keep in mind that both chlorine and fluoride are routinely added to drinking water. Other contaminants, like lead and mercury, can cause even more grave health concerns. Of course, the safety of your drinking water depends on where you live and other factors – but the bottom line is that drinking filtered water can help minimize the risk of certain health concerns associated with drinking water contaminants. Peace of Mind – Knowing that you are drinking clean, safe and tasty water can provide significant peace of mind – an invaluable commodity. Even if your water tastes fine and is relatively clean, nothing beats knowing that what you’re drinking is safe and pure. NSF Certification Standard – NSF International has several different certification standards. Each means something slightly different, and refers to the specific contaminants that each filter is certified to remove. We picked filters that – at a minimum – satisfied standards 42 and 53. You can learn more about NSF standards here. Reviews – Beyond the seal of approval from NSF, we also paid close attention to what everyday people thought of these products. Reading third party NSF water filter reviews allowed us to get a broader data set for each product’s effectiveness and durability. Value – We love helping our readers drink cleaner water – particularly when they don’t have to spend much to do so! We focused on finding excellent products at reasonable prices, that offered great value overall.